Since, every one knows better that, there is already built-in MTP (Media Transfer Protocol) in all Windows computers. In such a situation, the question is, why any one would like to download Media Tek USB Vcom Drivers? Yes, there is no need to download and install any third party software in Windows to connect a mobile phone or any other device to the computer. But, in some cases and scenarios, it becomes necessary for you to do some important stuff, that involves in changing your mobile's operating system then you would not like to take any risk. Any data connection error, while flashing or rooting a mobile phone can lead to a bricked phone. There is a better idea to create a strong connection before flashing or rooting a mobile phone. Why Media Tek USB Vcom Drivers? Media Tek USB Driver is the most used and important part to connect a mobile phone with a smart phone flash tool. A strong USB Driver is always required to flash a mobile phone. This strong USB Driver can help you in connecting the mobile phone in a better way. This is the reason, Media Tek USB Driver does has much importance and significance. Therefore, it is mandatory for you to check and care every step before flashing your mobile phone via a smartphone flash tool; like, checking of USB Drivers. If you have already installed, Media Tek USB Vcom Drivers on your PC, and, in spite of installation of this magic tool, your mobile does not connect with to the computer. You should check the Driver, check either it is an old version or new, if it is the old version, you need update that old version otherwise it will not work. On clicking the manual update button, you will see that it will browse you to the place, where you have already downloaded the Drivers, select the driver and open it. Your driver will be updated within some seconds. Before connecting the computer to Media Tek device for flashing with the custom or Stock-ROM, restart it once. Because, restart the computer enables the software modification. Now, connect the Media Tek device with your computer. If, there is no recognition error, then, you can freely and without any disturbance, use your phone and flash it. The entire process of flashing a mobile phone with custom and Stock-ROM has been described already in detail in my previous posts. The main point of that process is, after connecting phone and after downloading the scattered flash files, turn-off your mobile phone completely. Again, pressing of the combination of key, power button plus volume down and home button, it will take your phone to download mode. By this way, the download mode will make you a flash phone. 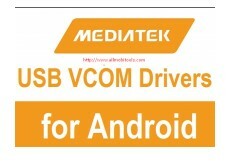 If you wish to get the latest and updated version of Media Tek USB VCOM Drivers, then just follow the link shared below and download this unique tool to flash your mobile phone. The main task for you to do is, tap the download button by clicking the download button and wait for its proper download. As it is suggested again and again, the before flashing of your mobile, take a backup of your precious data for future reference. Because, after successful flashing, your mobile will restore in its original or factory or default settings. in case of not taking the backup data, you will lose your data. The backup data will be restored after flashing of your mobile. We always provide the official download links for our visitors. These links are trustable and well working and also these links are scanned for dangerous viruses. In case, the link doesn't work or if there is a download error, contact us through your comments in comment section.